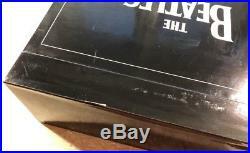 BOX: VG++ to EX /. OIS, POSTER, PHOTOS: NM (Foto /Photo). EX to NM- (please look below description of every LP). I never offer records with damages. No deeper scratches or damage - just superficial non sounding hairlines // keine tiefen Kratzer die den Klang stören, man kann oberflächliche Spuren vom herausnehmen der LP aus der Hülle sehen. 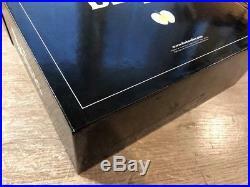 16 LP (12x1LP + 2x2LP) BOX SET. The Beatles - The Beatles. DAS BUCH IN DER BOX FEHLT! 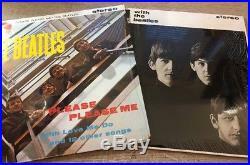 01: Please Please Me (PCS 3042, Parlophone). 02: With The Beatles (PCS 3045, Parlophone). 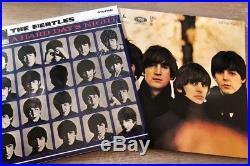 03: A Hard Day's Night (PCS 3058, Parlophone). 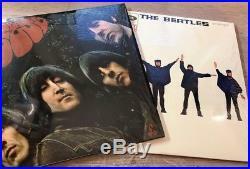 04: Beatles for Sale (PCS 3062, Parlophone). 06: Rubber Soul (PCS 3075, Parlophone). 07: Revolver (PCS 7009, Parlophone). 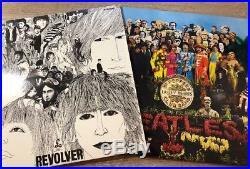 Pepper's Lonely Hearts Club Band (PCS 7027, Parlophone). 09: Magical Mystery Tour (2835, Capitol / BOOKLET). 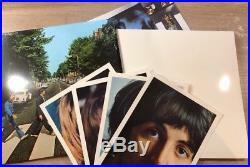 10: 2LP The Beatles (White Album, PCS 7067-8, Apple, 4 PHOTO + POSTER). Side1,3,4: NM-/ side2: EX (at the start of first song some soft tics and after lovely sound). 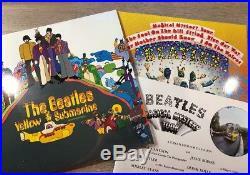 11: Yellow Submarine (PCS 7070, Apple) side1: NM- / side2: EX. 12: Abbey Road (PCS 7088, Apple). Side1: NM- / side2: EX to EX+ rare soft obscure. 13: Let It Be (PCS 7096, Apple) at the start of first song on both sides plays with soft tics and after EX+ to EX++ ultra rare soft obscure. 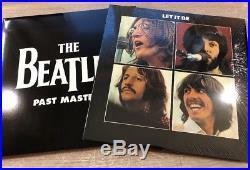 14: 2LP Past Masters (SET 5099969943515, 5099968463915/5099968464011, Parlophone/Apple) Parlophone:NM- / Apple:EX (at the start of first song some soft tics and after rare obscure soft tics). 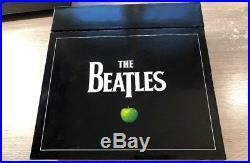 The item "16 LP BOX SET The Beatles The Beatles STEREO EU VINYL" is in sale since Wednesday, April 04, 2018. 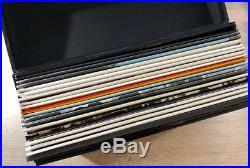 This item is in the category "Musik\Vinyl\Rock & Underground\Rock". The seller is "vinyl-support" and is located in Hoppegarten. This item can be shipped worldwide.